Men who inspire a generation are rare. They become legends, role models for higher achievements and icons in their field of excellence. Rahul Dravid, the gentle hard hitting first down batsman is one such personality who shall remain a role model in cricket and an ambassador of sports. He has made millions of cricket lovers across the world in general and in India particular proud by his outstanding performance. Rahul is one, said Australian speedster Glen McGrawth, who can step into the star-studded Australian team. That was a huge compliment to The Wall. It is not his constistent performance over the past 16 years scoring 36 centuries and 63 half centuries to amass 13,288 runs at a good average of 52.31 in 164 tests nor 10,889 runs with 12 centuries and 83 half centuries from 344 ODIs that has made him great. His great qualities as a team man, his commitment to the game and respect for his team mates have scripted his name in golden letters in the history of cricket. 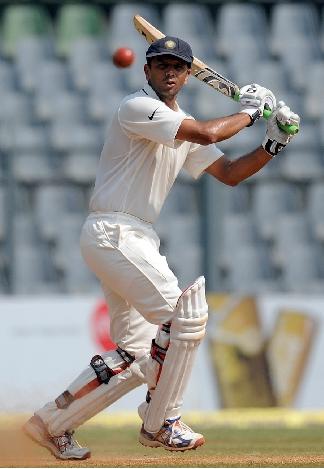 The joy of bonding together and striving to achieve a goal is, says Rahul, what made cricket special for me. He feels that he 'was fortunate to be part of a wonderful era. It is in fact the other way round; he created a new era by inspiring a new generation. His journey in the history of cricket has been wonderful. Lauding the fans he is generous, 'The game is lucky to have you and I have been lucky to play before you.' On his family he goes ecstastic, 'They created around me a positive environment which was essential to my success.' The selectors are often cynical which led Mohinder Amarnath to curse, 'They are a pack of jokers.' In contrast, Rahul had good words for them and found them to 'have more confidence' in him than he had in himself. Rahul was media friendly, too. He had patted the Physio and trainers, too, 'They worked hard to keep me fit, not an easy job, and allowed me to play late into my 30s.' A great compliment, indeed that reflects his great character. He was first-down batsman over years and has fielded at first slip to take record number of catches (210) in test cricket, pushing Australian Mark Wagh to second place. He was Wisden cricketer of the Year 2000, ICC player and best test cricketer of the year 2004. He had many memorable test innings. His marathon innings of 233 in 2003 to give India a magnificent victory in Adeleide test speaks a volume of his batting prowess. In one of the ODIs against Pakistan, captain Wasim Akram said after the match, ' India to make 50 runs with 5 wickets, yet I could have taken all, if only Rahul did not stand inbetween.' Can there be a greater compliment than this coming from another great captain!! Cricket fans, specially we in India, shall miss this illustrious worthy cricketer coming as first down to bat when India opts to bat and then to field in the first slip! We wish him all the best after retirement.